A New Year, New Kitchen Adventures! Happy New Year, food lovers! Between the holidays, travelling, and settling into my new apartment, the blog took a bit of a hit late last year. But we’re in a new year and I’ve got so much new content to work with! I’m experimenting with some things on Pinterest (believe it or not, up until a little while ago I had never really used Pinterest), searching for some new things to test out, and looking for some fresh ideas for the blog! Note: if you or anyone you know would be interested in guest-blogging, let me know! I’m challenging myself in the new year to make posting on this blog more of a priority, so be on the lookout for posts a few times a week! Some will be shorter, some will feature recipes, some may just be a few photos from my kitchen of things I’m working on, but I’m hoping to be able to bring you all more content in 2014! 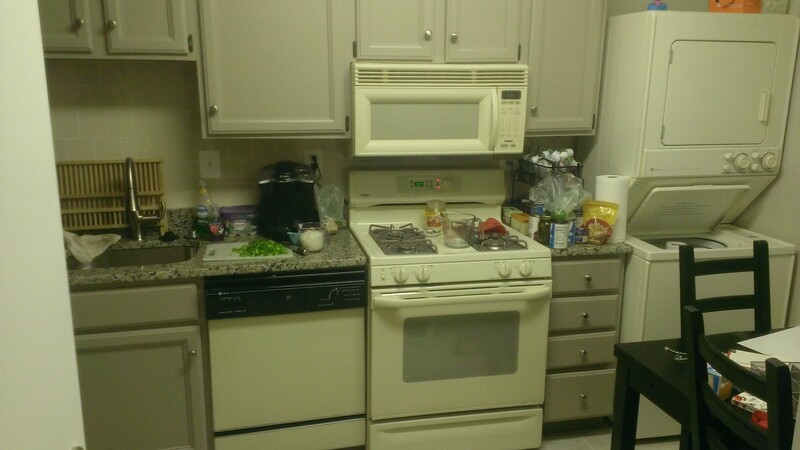 Back From Hiatus… And in a New Kitchen!!! My darling blog readers! I apologize for the lengthy hiatus, but the blog is BACK! The past few months have been a bit chaotic, but if you’ll bear with me, the blog will be back on a regular basis and better than ever! So, first bit of news I have is that not only is the blog back, but it’s back with a kitchen upgrade!!! I moved into a new apartment this weekend and after a few months of apartment issues at my old place, I am so very happy to be in a new place! This is also great news for the blog because, unlike the old kitchen, I actually have SPACE! So now while my cupcakes are baking or my quinoa is cooking, I can dance around my kitchen without risking bruises or knocking things over! Huzzah! Here’s a photo of the new kitchen! Granite countertops (perfect for rolling out dough!) and a washer/dryer (clean dishtowels!). LOVE. 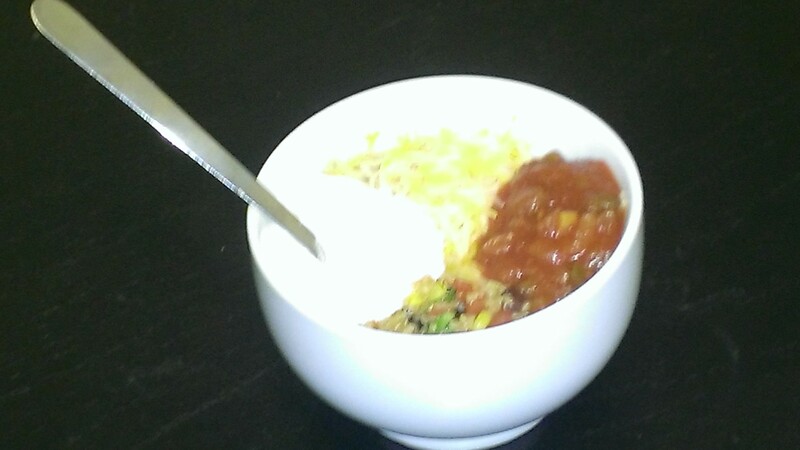 Look at that delicious bowl of quinoa! It tastes as good as it looks, I promise! Now, I’m a bit of a quinoa rookie, and I will admit to being a bit intimidated by trying it out at first, but I am telling you, it’s a winner. This recipe is a testament to that: there’s only 1 cup of uncooked quinoa in the recipe, but it bulks up a lot when it cooks and makes a big serving full of veggies and just enough spice to keep things interesting. Heat olive oil over medium heat in a medium-sized saucepan and saute the jalapeno and garlic until fragrant, approximately one minute. Stir in quinoa, veggie broth, beans, diced tomatoes, and corn (if you like it a bit spicier, I added some chopped green chilies I had on hand to kick it up a notch and it worked perfectly) and bring to a boil. Reduce heat and cover, simmering for 25 minutes or until the liquid is absorbed. Remove from heat and stir in cilantro and lime juice. Garnish with cheese, salsa, sour cream, and avocado if desired. Annnnnd, We’re Back! And I Brought Muffins! So, my sincerest apologies are in order. I’ve been a real blog-slacker the past few months. I could make all kinds of excuses, but I won’t, because you deserve better than that. But, I’ve pulled myself together and am committed to bringing you more recipes for delicious things, and a few other short posts to fill the spaces between baking projects! To make it up to you, dear readers, today I am bringing you what is perhaps the best muffin recipe I’ve ever made. And I mean EVER. Do you like melted cheese? (Of course you do. Why wouldn’t you?) Do you like jalapenos? (Perhaps you do, perhaps you don’t. But you should try this out anyway. I promise.) Well then, do I have a recipe for you! 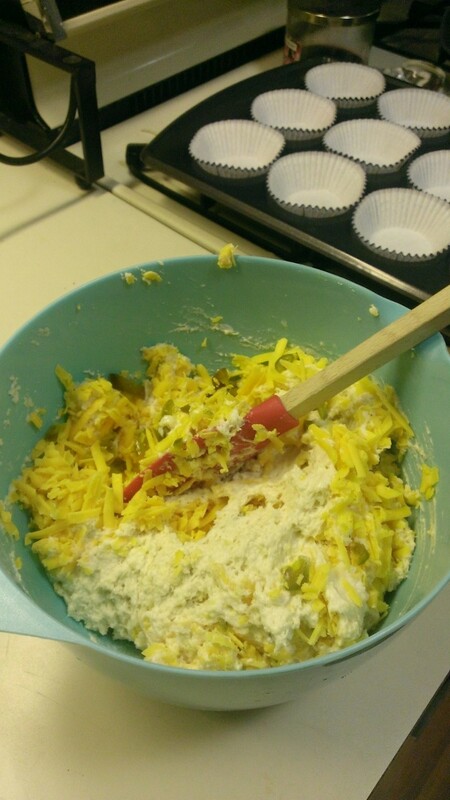 It just so happened that Joy had recently posted a recipe for “Too Much Cheddar and Jalapeno Muffins.” Cheese? Check. Carbs? Check. A little bit of spice to make it interesting? Check. Done deal. Making these ASAP, friends. So, what is my recommendation to you, my dear readers? Step one: Go out and buy too much cheddar and a jar of jalapenos. Step two: Get ye to your kitchen and bake these muffins as soon as humanly possible. Step three: Eat one of these delicious treats while they’re still hot. And maybe use a fork, they are kind of custard-y and melty when they’re fresh (which is by no means a bad thing, and is in fact quite delicious). Step four: find a home for all that extra cheese. Perhaps in a second batch of these muffins to share. My goodness, look at that cheese!!! 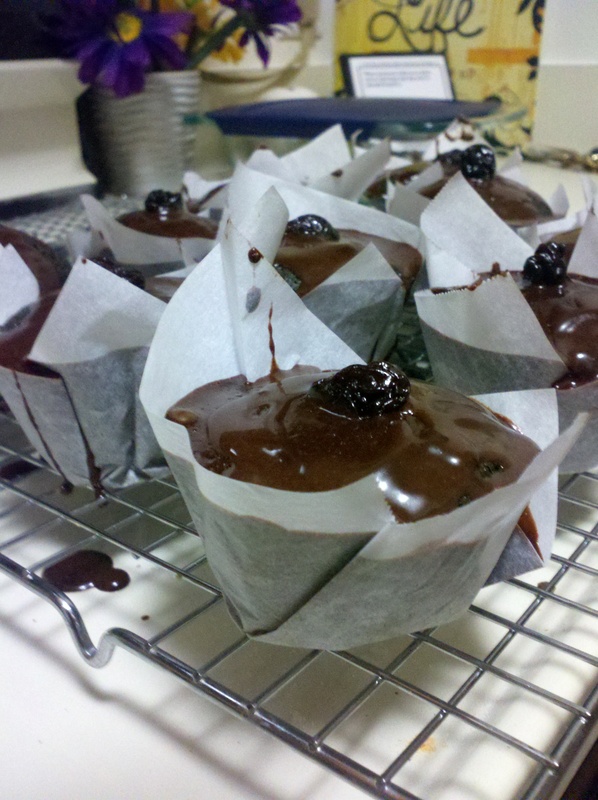 **Baker’s Note: paper muffin/cupcake liners don’t work especially well with this recipe. When the muffins are hot they stick to the paper, but once they cool, they will start to come out of their wrappers. My advice: skip the paper altogether and just give your muffin tin a good coat of grease and flour. Preheat the oven to 375 degrees, making sure that your oven rack is in the upper third of your oven. Grease and flour your muffin tin and set aside. In a medium bowl, whisk together flour, baking powder, sugar and salt. Set this mixture aside. 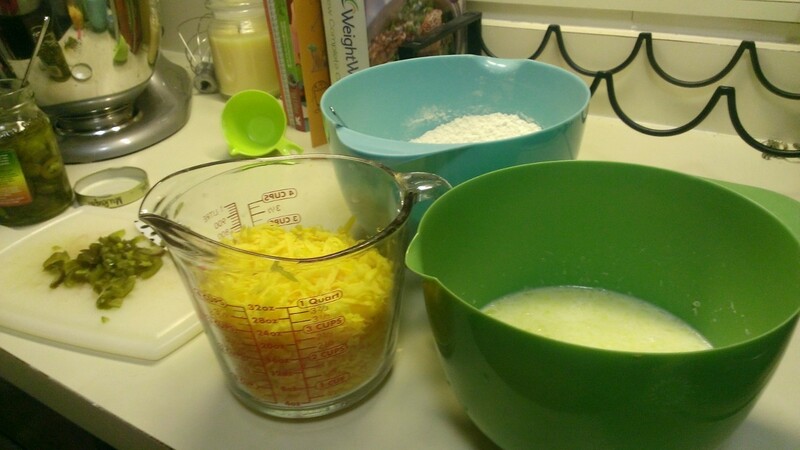 In a small bowl, whisk together milk, egg and melted butter. Add the wet ingredients all at once to the dry ingredients. Stir to incorporate. Before the mixture is entirely mixed, add the grated cheese and diced jalapeno. 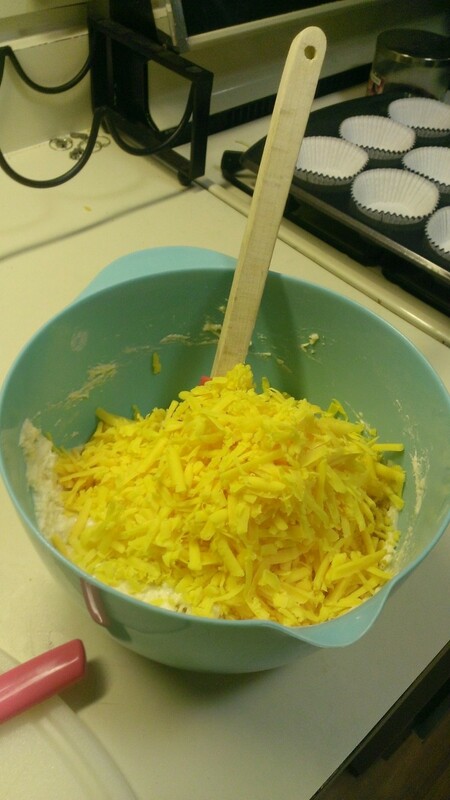 Stir to incorporate, making sure that the mixture is evenly moistened and the cheese is well distributed. 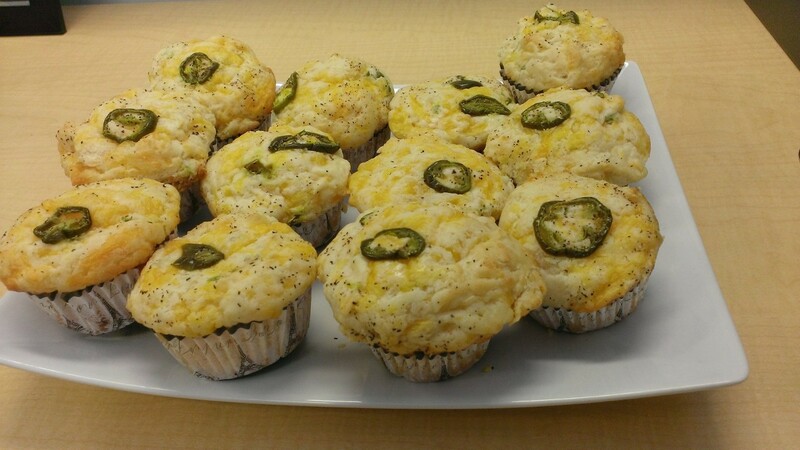 Divide batter between muffin tins, top each with a jalapeno slice and sprinkle with sea salt and pepper as desired. Pop your muffins in the oven for 20-25 minutes, or until golden brown and cooked through. Wait patiently while they cool as to not burn your tongue (this is by far the hardest part, guys). Enjoy! As you may have gathered, I have a love for cupcakes that knows few bounds. Some of my earliest experiments in baking were cupcakes. And why not, right? They come together quickly, there’s no leveling of layers and hassling with stacking necessary and best of all, they’re easy to share! What’s not to love? And how do you make a standard chocolate cupcake even better, you ask? You add some wine. That’s right, wine. 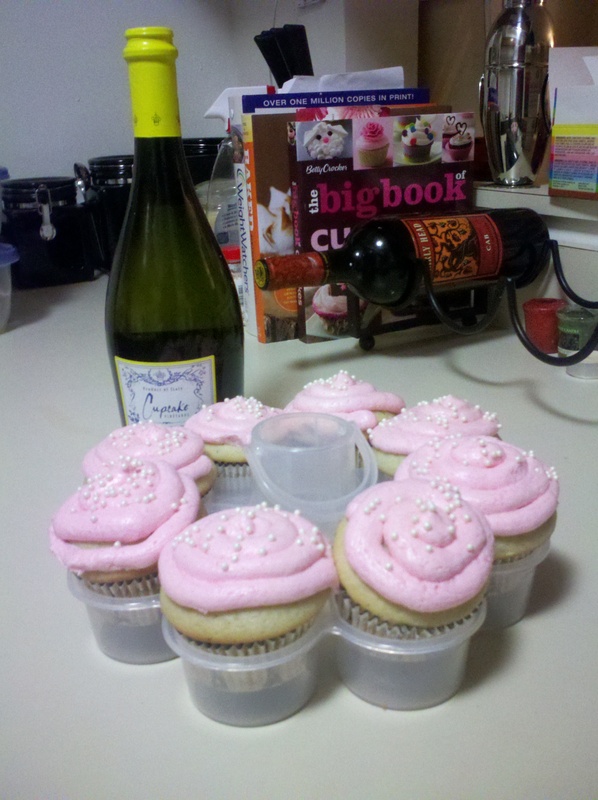 I had heard of red wine cupcakes before, but I had yet to find a recipe I loved. So, as I occasionally do when I struggle to find exactly what I want, I turned my search over to the algorithms over at Google. The search did not disappoint: there are literally hundreds (if not thousands) of red wine cupcake recipes out there. After some browsing, I stumbled upon a cupcake that lived up to my demands: A Cabernet Chocolate Cupcake with Dark Chocolate Ganache at the Adventures in Cupcakes blog (which no longer appears to be publishing new material, but which had a nice array of recipes to share). She had taken the cupcake recipe from a blog at iVillage, but had replaced their suggested whipped cream topping with a rich, bittersweet chocolate ganache, a change that I too preferred. Since I planned on sharing my creations with others, I wanted a more portable, less perishable cupcake, meaning whipped cream was out and ganache was most definitely in. Plus, this recipe calls for dried cherries, a personal weakness of mine. Chocolate. Wine. Cherries. 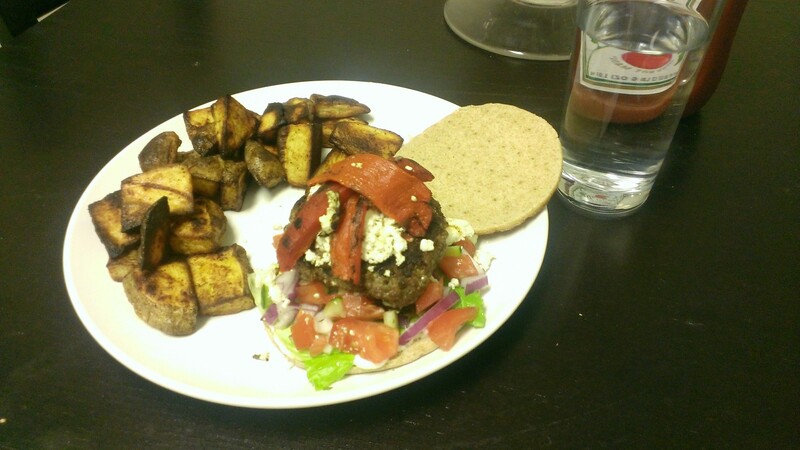 This was a match made in culinary heaven. The cupcakes came together fairly effortlessly. There are only 5 simple steps needed to make the cupcake base, and the ganache is one of the simplest I’ve ever made. I did make a tiny change in the ganache recipe by adding a splash of red wine, just to add a hint of the cabernet flavor to the topping. I will note that the cupcakes are a tiny bit dry, a problem I cannot quite figure out how to solve yet, but if I do, I’ll be sure to write a follow-up post. The ganache does make quite a bit more than I found I could use for one batch of cupcakes, but if you baked another half batch of cupcakes this problem could easily be solved. Or, you know, you could eat it with a spoon. Whatever you see fit. The outcome: delightful. The cupcakes have a nice, bittersweet flavor of chocolate with hints of wine, but neither ingredient overpowers the other. The dried cherries add a bit of sweetness without making the cake overly sweet, exactly what I was looking for in this cake. For a red wine cake, I expect a little less sweetness in the flavor, but for those of you who like your cake to be extra sweet, stay tuned for my experiments with white wine and champagne cupcakes coming soon! 2. in a large bowl (if you’ll be using a hand mixer) or the bowl of an electric mixer, sift together the flour, sugar, baking soda, baking powder, salt, cinnamon and cocoa powder. 3. Add the oil, vanilla, eggs and wine. 4. Beat with the electric mixer at low speed for 30 seconds. Turn the mixer speed to high and continue beating for three minutes, scraping the sides occasionally. 5. Remove the bowl from the mixer and gently fold in the dried cherries with a spatula. Pour the batter into the prepared cupcake pan. Bake for 20 minutes or until a toothpick inserted comes out clean. For the ganache, place chocolate (and wine, if desired) in a medium stainless steel bowl. Heat cream and butter in saucepan over medium heat and bring just to a boil, being careful not to let the cream scald. Immediately pour the boiling cream mixture over the chocolate and let stand for 5 minutes. Stir with a whisk until chocolate is melted and the mixture is smooth.